By combining the silver with a little bit of aluminum, the team found that it was possible to produce exceptionally thin, smooth layers of silver that are resistant to tarnishing. They applied an anti-reflective coating to make one thin metal layer up to 92.4 percent transparent. In addition, the team showed that the silver coating could guide light about 10 times as far as other metal waveguides. And they layered the silver films into a metamaterial hyperlens that could create dense patterns with feature sizes a fraction of what is possible with ordinary ultraviolet methods, on silicon chips for instance. Screens of all stripes need transparent electrodes to control which pixels are lit up, but touchscreens are particularly dependent on them. A modern touchscreen is made of a transparent conductive layer covered with a non-conductive layer. It senses electrical changes where a conductive object – such as a finger – is pressed against the screen. “The transparent conductor market has been dominated to this day by one single material,” said L. Jay Guo, a professor of electrical engineering and computer science. The project started when Guo and his students were exploring how nanopatterns in silver can generate color by selectively reflecting light. Silver could produce red and green but not the shorter blue wavelengths. Aluminum could, but it absorbs too much light. So the team tried to get the best of both worlds by combining aluminum with silver. Cheng Zhang, a recent doctoral graduate in electrical engineering and computer science who now works as a post-doctoral researcher at National Institute of Standards and Technology (NIST), made an aluminum-silver film and showed the results to Guo. The film was thin enough to be transparent and an electron microscope image showed it to be much smoother than a pure silver film. 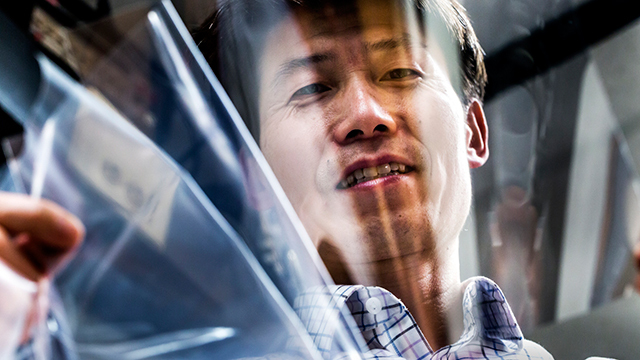 “Once Cheng showed me that this can produce a very smooth, thin film, I decided to work on this instead,” said Guo. Usually, it’s impossible to make a continuous layer of silver less than 15 nanometers thick, or roughly 100 silver atoms. Silver has a tendency to cluster together in small islands rather than extend into an even coating, Guo explained. By adding about six percent aluminum, Zhang coaxed the metal into a film of less than half that thickness – seven nanometers. What’s more, when they exposed it to air, it didn’t immediately tarnish as pure silver films do. After several months, the film maintained its conductive properties and transparency. And it was firmly stuck on – pure silver comes off glass with Scotch tape. The team believes that the aluminum is responsible for these improvements. It attaches strongly to the oxygen in glass, anchoring the silver. Once the film is exposed to air, extra aluminum migrates toward the surface to bind with oxygen there. Guo believes that the oxidized aluminum forms a network over the silver surface, blocking more oxygen from binding to the silver. The network also keeps the silver from clumping up when exposed to heat. In addition to their potential to serve as transparent conductors for touchscreens, the thin silver films offer two more tricks, both having to do with silver’s unparalleled ability to transport visible and infrared light waves along its surface. The light waves shrink and travel as so-called surface plasmon polaritons, showing up as oscillations in the concentration of electrons on the silver’s surface. Those oscillations encode the frequency of the light, preserving it so that it can emerge on the other side. While optical fibers can’t scale down to the size of copper wires on today’s computer chips, plasmonic waveguides could allow information to travel in optical rather than electronic form for faster data transfer. As a waveguide, the smooth silver film could transport the surface plasmons over a centimeter – enough to get by inside a computer chip. “If you can make each layer thin and smooth – and especially thin – the properties of this metamaterial get better,” said Guo. Such lenses can image objects that are smaller than the wavelength of light, which would blur in an optical microscope. It can also enable laser patterning – such as is used to etch transistors into silicon chips today – to achieve smaller and smaller features. A paper on this research, titled “High-performance Doped Silver Films: Overcoming Fundamental Material Limits for Nanophotonic Applications” is published in the journal Advanced Materials. The study was supported by the National Science Foundation (grants DMR 1120923 and DMR 1506535), the Air Force Office of Scientific Research (grant FA9550-14-1-0138) and the Beijing Institute of Collaborative Innovation. The thin silver layers were produced at the Lurie Nanofabrication Facility at U-M. The University of Michigan has applied for a patent and is seeking partners to bring the technology to market.